1Department of Internal Medicine, Second University of Naples, Italy. 2Lecturer, Master "Nutrition and Wellness", Department of Pharmacology and Biomolecular Sciences, University of Milan, Italy. Lecturer, Master "Nutrition and Wellness"
Lipodystrophy (LD) represents a typical complication of drug injections repeatedly performed into the same skin area and/or needle reuse and is a major complication of subcutaneous therapy, including lipohypertrophy and lipoatrophy. It has been associated to insulin, as well as, to a number of other drugs as pegvisomant, TNFα inhibitors and glucagon-like peptide-1 receptor agonists (GLP1-Ras) including exenatide and its longacting once-weekly formulation (EQW) as already reported in specific registration studies. Accordingly, this article provided the ultrasound documentation of subcutaneous nodules occurring after EQW injections in a series of 56 diabetic subjects and described a possible association between the ultrasonography structures of observed lesions and missing injection site rotation. This was similar to what already reported with respect to skin lipohypertrophy and inappropriate insulin injection techniques. Lipodystrophy (LD) represents a typical complication of drug injections repeatedly performed into the same skin area (Richardson 2003) and/or needle reuse (Blanco 2013) and is a major complication of subcutaneous insulin therapy, including lipohypertrophy (more frequent; LH) and lipoatrophy (less frequent; LA). Moreover, a close relationship has been documented between dose (and hence volume) of injected insulin and LH (Blanco 2013) and the presence of LH has been described also with other drugs like pegvisomant (Marazuela 2007; Bonert 2008; Rochira 2012). A number of injection siterelated adverse events were also reported in the registration studies of the long-acting once-weekly formulation of a subcutaneously injected Glucagon-Like Peptide 1 Receptor Agonists (GLP1-RA) called exenatide (EQW) (Buse 2010; DeYoung 2011). All the above prompted us to evaluate whether EQW could cause skin alterations. We decided to examine a limited patient sample first, to try and understand whether the phenomenon is present even in real life conditions following EQW injections and, if so, how long it persists in people correctly performing injection site rotation. 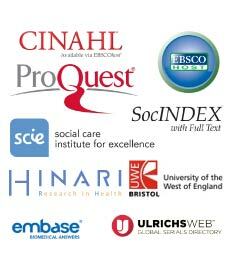 We designed a 48 week duration observational study based on the electronic records from 72 patients receiving EQW. The protocol was prepared according to the Helsinki declaration and approved by the local Ethics Committee. All patients signed an informed consent to the anonymous utilization of their own results. We included in the study only the electronic records of patients endowed with a complete set, including clinical data and reports concerning educational interventions performed both before and 48 week after treatment started and the results of at least three contacts with the Diabetes Unit staff after enrollment (weeks 16, 24 and 48). The latter consisted of a thorough examination including injection site inspection/ palpation and skin ultrasound scans according to our previously described method (Gentile 2016a). The use of skin ultrasound is in fact part of our unit’s standard routine for all patients on injections but its frequency was higher than usual for those on EQW because a high rate of local side effects had been described already in terms of small, non-prominent, subcutaneous nodules having a hard-elastic texture (Buse 2010; DeYoung 2011). All patients underwent a second educational step 24 weeks after treatment started according to our protocol dedicated to all patients starting injections (with either insulin or GLP1-RA). Patients experiencing generalized side effects were excluded, along with those discontinuing treatment, or unable to keep a date. Due to that, 56 subjects only were accepted for the study. The main clinical features of participants are given in Table 1 and may be briefly summarized as follows: 35 were male, age was 55 ± 11 years, diabetes duration was 7 ± 3 years (range 5-10), 53 were on metformin (48 associated to secretagogues or pioglitazone) and 3 who were metformin-intolerant took gliclazide and acarbose. High-frequency B-mode skin USSs were performed invariably using a linear 20 MHz probe (Philips HD3®). Intra-/inter-observatory variability for diagnostic accuracy is <3% in our hands (Table 1). Mean ± Standard Deviation, n. or percentage. * OHA=oral hypoglycemic agents; 53 were on metformin (48 associated to secretagogues or pioglitazone) and 3 metforminintolerant took were on gliclazide and acarbose. Table 1: Characteristics of the population under study. At baseline one-to-one sessions lasting up to 15 min were led by facilitators specifically trained at using a dedicated starter kit to explain the fundamental steps involved in the preparation and administration of a simulated dose using the exenatide onceweekly injection device. After that facilitators asked participants to use patient-oriented instructions to prepare a dose of placebo using the exenatide once-weekly device and start training by injecting it into a rubber ball (Lorenzi 2010). A special effort was also made, by delivering written instructions, to explain how important a careful injection area and site rotation technique is. At week 24, just before the educational refresher session, patients were repeatedly asked whether they had properly performed site rotation and were regularly checked thereafter at all their injection sites, in search of any skin abnormalities. All nodules, especially when aggregated, prompted facilitators to reinforce educational messages (Table 2). A questionnaire containing an arbitrary evaluation score scale was also used to draw into the open individual rotation styles and local injectionrelated symptoms. Based on that, patients were split into two groups: one correctly rotating injection sites (n=11, rotating group, RG), the other unable to do so (n=45, non-rotating group, NRG). Each of those areas should be used for injection site rotation: how many times did you comply with this suggestion? Did you feel any pain at the injection site? Did you feel any burning and/or notice any hardening of the skin at the injection site? Table 2: Questionnaire administered at visit 24 and 48 to investigate upon patients' habits as for injection site rotation and eventually occurring local injection-related side effects. Answers generated an arbitrary score scale used to quantify behavior and symptom changes. At week 48, a further education refresher session was performed and the questionnaire was administered once again. Continuous variables were reported as mean ± Standard Deviation and were compared between groups by Student’s t-test for independent samples or analysis of variance (ANOVA) as needed. Non-parametric tests were used when appropriate. Categorical variables were summarized as frequency or percentage and their bivariate associations were evaluated by Chi-square with Fisher exact test. The analyses were carried out using STATA software, Version 12 (Stata Corp, College Station, TX, USA). P-values <0.05 were chosen as statistically significant (Table 2). Overall injection site-related adverse event rate in RG and NRG patients is described in Table 3. As shown, at week 24 nodules were detectable in both groups with a similar rate, but more multiple nodules were found more often in NRG patients (80.0% vs. 54.6% in RG; p<0.01); at week 48 clustered nodules within a 5 × 5 cm skin area were detected at a much higher rate in NRG patients (66.7% vs. 9.2% in RG; p<0.01). As opposed to that, to a week 48 RG people displayed a significantly decreased nodule rate compared to week 24 (90.9 vs. 54.6%; p<0.01), while the reduction of the NRG was much smaller and not significant (95.6 vs. 89.0%; p n.s.) and even only one case of clustered nodules in RG vs. 30 subjects NRG (66.7%; p<0.01). Moreover, at week 24, NRG patients had a significantly higher rate of injection site-related adverse events (S-RAE). In both NRG and RG a further, yet statistically insignificant, reduction in S-RAE was observed from 24 to 48 weeks. Table 3: Subcutaneous nodule and other injection site-related adverse event rate in correctly rotating (RG) and non-rotating (NRG) patients. However, when subjects injected EQW into restricted areas without rotating sites correctly, their skin profile was severely altered (Figure 1) and, along with local injection symptomatic side effects, persistent signs of subcutaneous inflammation were documented by USSs (Figures 2-4 and Table 3). 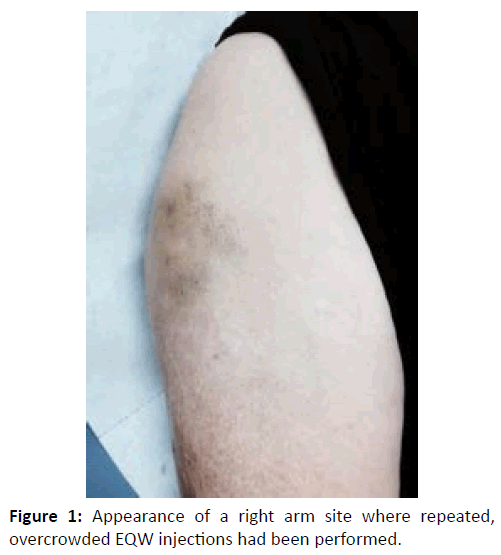 Figure 1: Appearance of a right arm site where repeated, overcrowded EQW injections had been performed. Figure 2: Panel a: Single hypoechoic nodule 8 mm below the skin surface detected after 4 weeks after EQW injection (thigh); Panel b: Multiple hypoechoic nodules with hyperechoic border found 8 weeks after clustered injections. Figure 3: Ultrasound image of multiple nodules found 8 weeks after injections performed within a small skin area in the arm. Nodules displayed hypoechoic patterns with hyperechoic borders. 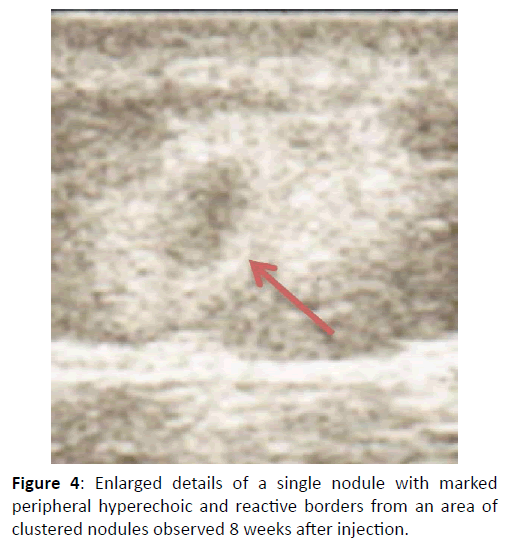 Figure 4: Enlarged details of a single nodule with marked peripheral hyperechoic and reactive borders from an area of clustered nodules observed 8 weeks after injection. This article provided for the first time the ultrasonography documentation of subcutaneous nodules after EQW injections and described a possible association between the ultrasound structure of observed lesions and injection site rotation behavior, in analogy with what had been widely shown in terms of skin lipohypertrophy and inappropriate insulin injection techniques. In greater detail, we previously documented that skin lipohypertrophy can take various forms, including small, invisible, yet palpable subcutaneous nodules at insulin injectionsites (Gentile 2016b) and this was reported by other groups for EQW as well (Buse 2010; DeYoung 2011) . EQW is based on a 2 mg dose of exenatide encapsulated in 40 mg poly(D,L-lactideco- glycolide) (PLG) microspheres within a total volume of 0.65 mL. In a placebo-controlled study, EQW associated injection site nodules were reported by 80% patients (Amylin Pharmaceuticals, Inc., data on file) (DeYoung 2011). An informal communication from DURATION-1 study staff pointed out that nodules were generally 0.5–0.75 cm in diameter, and their incidence seemed to decline over time, even in patients with numerous earlier episodes. Some nodules were only palpable, whereas others were visible. Nodules vanished in all but two DURATION-1 patients, who took longer but eventually solved this problem. One of these patients withdrew (Buse 2010). The rate of noduleassociated adverse events (including long-standing pain, skin thickening, redness, bleeding, or inflammation) was low in the placebo-controlled trial (6.7%) and in DURATION-1 (0.7%) (Buse). Other injection site adverse events observed during DURATION-1 were generally mild in intensity and relatively rare, and mostly disappeared within a month. The most common among them was pruritus at the injection site, although its rate appeared to wane over time from 11.0% between weeks 4 and 6 to 4.6% between weeks 28 and 30 (Grimm 2013). Actually a mild inflammatory ‘‘foreign body reaction’’ can occur in response to injected microspheres. In a prototypical reaction (Anderson 2008), polymorphonuclear leukocytes, monocytes/macrophages, and lymphocytes migrate to a foreign body. After several weeks, macrophages predominate and subsequently fuse to form giant cells enclosing the foreignbody, often associating with a fibrous capsule surrounding the reaction site. In the case of microspheres, it is thought that the macrophages and giant cells contribute to biodegradation by incorporating fragments as the microsphere polymers hydrolyze. Just because of the foreign body reaction, then, small nodules may be observed at the injection site after subcutaneous injection of any drugs using PLG microsphere technology (Anderson 1997). The thick hyperechoic nodule borders ultrasonographically described in small areas where several EQW injections had been performed close to one another and their persistence longer than observed in the case of small, single nodules found in correctly site rotating patients seem to point to an exaggerated foreign body reaction (Anderson 1997). This phenomenon occurred equally at any sites (i.e., arms, legs or abdomen). We cannot establish whether or not it affects EQW pharmacokinetics as the only paper trying to evaluate exenatide bioavailability/pharmacokinetics could not detect any differences related to local reactions, yet EQW is quite different from plain exenatide (Calara 2005), therefore studies are warranted concerning possible associations between injections related skin changes and EQW bioavailability/ pharmacokinetics. The fact that in both NRG and RG a slight, yet statistically insignificant reduction in S-RAE was observed from 24 to 48 weeks allows hypothesizing that educational activities provide best results in the beginning, and after 24 weeks their effects stabilize letting typical drug consequences take center stage. For the time, however, we can only say that, when performed within confined areas, EQW injections generate much longer lasting, and painful subcutaneous nodules accompanied by higher S-RAE rates. The limitation of this study is represented first of all by the small sample size and secondarily by its observational nature. Further investigations on larger samples are warranted to confirm our findings. Still it takes credit for describing for the first time new morphological aspects related to the EQW injection technique. While waiting for further information on drug bioavailability/ pharmacokinetics, we underline the need to improve training of patients undergoing such treatment. We feel strongly indebted to all patients participating in the study. Anderson JM, Shive MS (1997) Biodegradation and biocompatibility of PLA and PLGA microspheres. Adv Drug Deliv Rev 28: 5-24. Anderson JM, Rodriguez A, Chang DT (2008): Foreign body reaction to biomaterials. Semin Immunol 20: 86-100. Blanco M, Hernández MT, Strauss KW, Amaya M (2013) Prevalence and risk factors of Lipohypertrophy in insulin-injecting patients with diabetes. Diab Metab 39:445-463. Bonert VS, Kennedy L, Petersenn S, Barkan A, Carmichael J, Melmed S (2008) Lipodystrophy in patients with acromegaly receiving pegvisomant. J Clin Endocrinol Metab 93:3515-3518. Calara F, Taylor K, Han J, Zabala E, Carr EM, Wintle M, Fineman M (2005) A randomized, open-label, crossover study examining the effect of injection site on bioavailability of exenatide (synthetic exendin-4). Clin Ther 27:210-215. DeYoung MB, MacConell L, Sarin V, Trautmann M, Herbert P (2011) Encapsulation of exenatide in poly-(D,L-lactide-co-glycolide) microspheres produced an investigational long-acting once-weekly formulation for type 2 diabetes. Diabetes Technol Ther 13:1145-1154. Dunbar JM, Madden PM, Gleeson DT, Fiad TM, McKenna TJ (1994) Premixed insulin preparations in pen syringes maintain glycemic control and are preferred by patients. Diabetes Care 17:874-878. Gentile S, Guarino G, Giancaterini A, Guida, Strollo F and AMD-OSDI Italian Injection Technique Study Group (2016a): A suitable palpation technique allows to identify skin lipohypertrophic lesions in insulin‑treated people with diabetes. SpringerPlus5:563. doi: 10.1186/s40064-016-1978-y. eCollection 2016. Grimm M, Han J, Weaver C, Griffin P, Schulteis CT, Dong H, Malloy J (2013). Efficacy, safety, and tolerability of exenatide once weekly in patients with type 2 diabetes mellitus: an integrated analysis of the DURATION trials. Postgrad Med 125:47-57. Lorenzi G, Schreiner B, Osther J, Boardman M (2010) Application of Adult-Learning Principles to Patient Instructions: A Usability Study for an Exenatide Once-Weekly Injection Device. Clinical Diabetes 28:157-162. Marazuela M, Daudén E, Ocón E, Moure D, Nattero L (2007) Pegvisomant-induced lipohypertrophy: report of a case with histopathology. Ann Intern Med. 147:741-743. Richardson T, Kerr D (2003) Skin-related complications of insulin therapy: epidemiology and emerging management strategies. Am J ClinDermatol 4:661-667. Rochira V, Zirilli L, Diazzi C, Romano S, Carani C (2012) Clinical and radiological evidence of the recurrence of reversible pegvisomant-related lipohypertrophy at the new site of injection in two women with acromegaly: a case series. J Med Case Rep 6:2.